We’re down to the last month of training before our challenging series of fall races begins. Between mid-September and late October, we’ll each run four races ranging in length from 10K to half (me) or full (M) marathon. Our first fall event, Reach the Beach NH, kicks off in four weeks, and each of our big events takes place less than a month later. All of that means we’re in the thick of things when it comes to our training plans…and before yesterday we were in a rut, too. Training for a long race serves multiple purposes. Beyond basic conditioning of both the cardiovascular and skeletomuscular varieties (so you can actually finish an event…), training runs help you figure out what to wear, what to drink, and what to eat during long runs. Those particulars are specific to each runner, and it’s best to figure them out long before race day. Training runs also help your mind push through walls your body encounters and your body push through walls your mind erects. They expose you to different terrain, weather conditions, and levels of physical and mental fatigue. Every runner wants conditions on race day to be ideal, but they rarely are. Training in less-than-ideal conditions makes it a little easier to handle any race day hiccups. Our current training plans have us running four days a week, with one or two days of cross-training and one or two days of rest. Weekly mileage for me averages between 15 and 20 with a planned max of 25. M’s weekly mileage averages between 25 and 30 with a planned max of 35. Neither of us has run with such frequency or consistency prior to now, and we’re both feeling the effects, physically and mentally. We’re not injured, but we’re sore. We’re not surrendering, but we’re struggling. Distances and routes that were routine a few months ago have become tough to tackle, and I was wondering if I would ever run more than seven miles again. 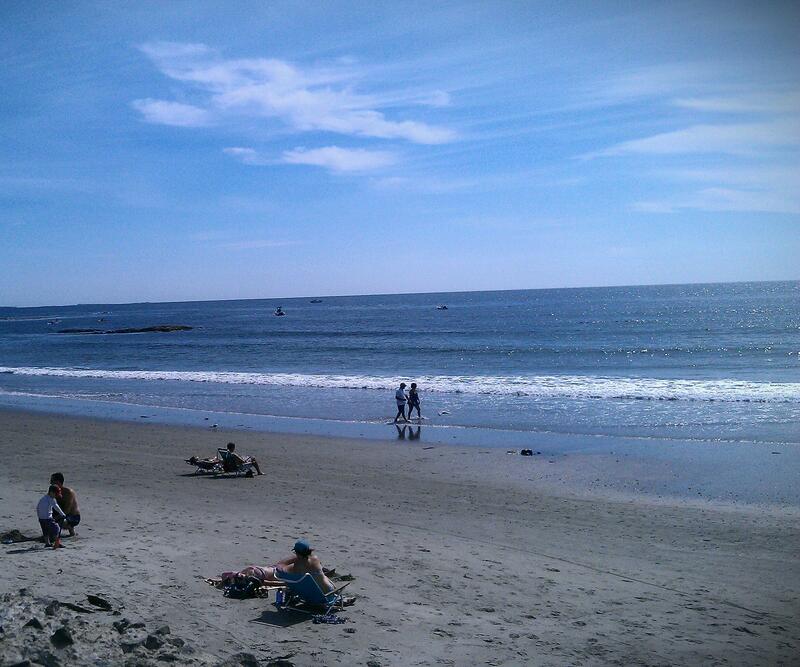 So in the spirit of notching a mental victory, I suggested we take our scheduled 8-mile runs to the beach yesterday. We are fortunate to live 20 minutes from the coast where the sidewalk is long, the terrain is flat, and the views are a nice distraction. Music was also a good distraction yesterday. I’ve been running without my iPod lately, in part to simplify my routine (one less thing to remember or carry) and in part because many races discourage the use of headphones (for safety reasons). I don’t want to be dependent on a soundtrack to run well. But yesterday called for some serious tunes to help me get my groove back, so I cranked the volume. Thumping bass and inspired lyrics and silly hooks…I heard them all and sang a few out loud (much to M’s amusement on the crowded boardwalk). Part of the route we ran covered mileage that we’ll revisit during two of the fall races we’re signed up to run, including my final leg of the RTB relay: Stage 36 of 36, a 4-mile leg from Winnacunnet High School to the finish line on the sands of Hampton Beach State Park. By the time I start out on that journey, our team will have been riding in vans and leapfrogging each other for nearly 200 miles. Yesterday, while passing the intersection of 101A where I’ll round the corner with three miles to go, I tried to imagine how I will feel that day. Exhausted? Exhilarated? Anxious? Determined? Probably all of those things, but I still have several long runs ahead of me before I get to find out. This entry was posted on August 20, 2012 by Words Per Gallon. It was filed under Geography, Running and was tagged with beach, half marathon, marathon, music, New Hampshire, reach the beach, running, training, training plan. I have one rule and one rule only, when Eye of the Tiger comes on the iPod, walking is not allowed! 😀 Good luck with the rest of your races, sounds like you’re more than prepared! Thanks for the reply! Our current ‘go to’ songs are “Lose Yourself” and “Dog Days Are Over”. We have the same rule…no walking!